will one day, perhaps, be bigger than her own. Mary, she knew, that smallness was destined to be greatness. that smallness would become such Bigness. 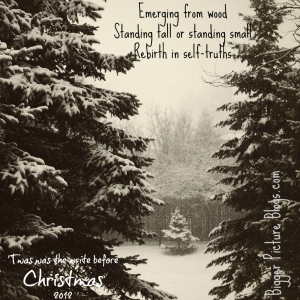 Join us in creating as we get into the Christmas spirit! So, now that I've read this about six times...I'm struck by the thought that my son is still eight years shy of the 30 or so years that Mary waited for Jesus' ministry to begin. It's so true - as you write - that she knew...yet it was beyond her heart. Seems that this is what it means to grow in faith...to know and hold on to that Bigness and Love that is just beyond our hearts...Thanks for this! Exquisite, Hy! This time of year I think of Mary- often! Just loved this piece.